You only need to read its spec sheet and drool over pictures to see the carbon-framed, limited-edition Ducati 1299 Superleggera is faster, lighter, cleverer and sexier than its Panigale brothers and sisters, as it should be for the price. But riding it is an assault on the senses. 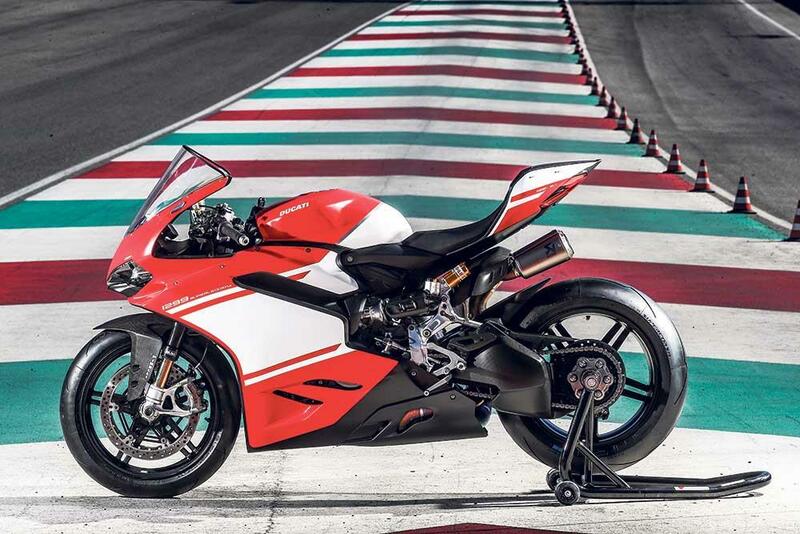 Ducati’s new electronics control slides, spins and wheelies so precisely they conspire to make this one of the hardest accelerating motorcycles this side of a MotoGP paddock. The trickiest part is hanging on. 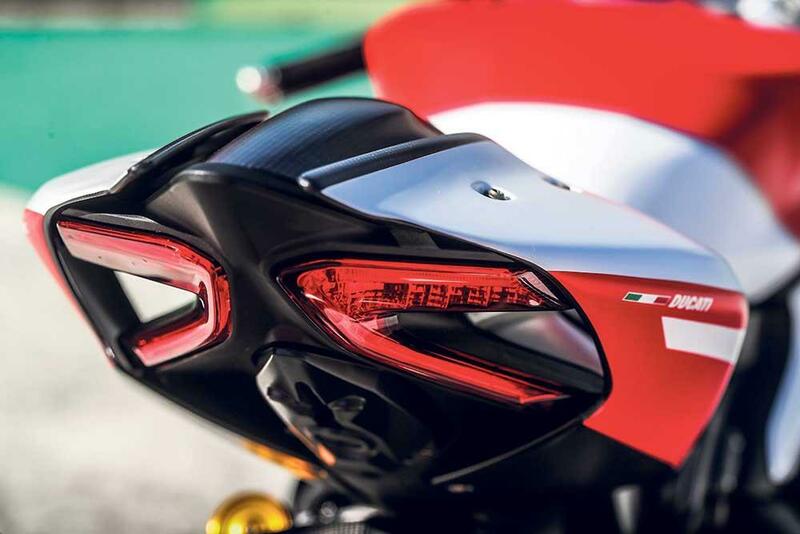 A high-strength carbon fibre monocoque chassis is 40% lighter (-1.7kg) than the cast ali item found on the rest of the Panigale range and the single-sided swingarm offers another 18% weight saving (-0.9kg). The rear subframe, fairing, mudguard, hugger and exhaust heat shield are all carbon. Only the fuel tank is aluminium. 1.4kg lighter wheels are carbon fibre with aluminium hubs. Ducati claims 26% less rolling resistance at the front and 44% at the rear. They’re shod with Pirelli Diablo Super Corsa SP trackday tyres. 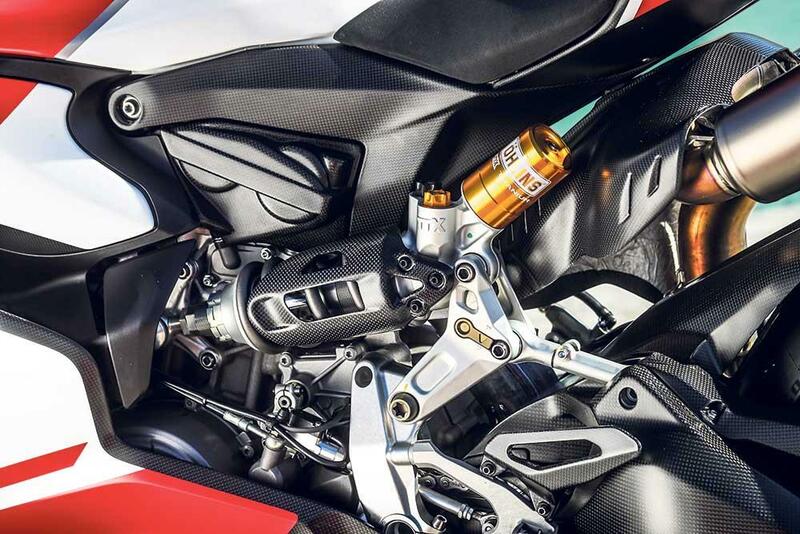 Fully adjustable Ohlins 43mm FL936 forks weigh 1.35kg less than the Ohlins on the homologation special Panigale R. At the rear the Ohlins TTX36 shock is fitted with a titanium spring and saves a further 0.5kg. Superbike-inspired Brembo M50 radial calipers with race pads bite twin 330mm front discs. Ducati claims 156kg dry, but it’s actually 167kg wet, with no fuel and 178kg with its 17-litre tank full to the brim. To make that figure come alive for you, a Yamaha MT-07 weighs 4kg more…and makes 146bhp less. The crankshaft is actually the single weightiest part of the entire machine. You feel that complete lack of weight, a hollowness that defies belief on a 1300cc superbike every inch of the way and as speeds build that sense of airy lightness never goes away. It takes little effort to flick this wondrous, thunderous motorcycle from side to side through the high-speed chicanes and it carves with complete precision through fast corners. The 1299 Superleggera has been developed at exotic European tracks including Nardo, Jerez, Vallelunga, Mugello, Portimao and Aragon, but like the rest of the Panigale family it demands a unique riding technique. It will shake and wobbles in protest, if you grab it by the scruff of the neck, but caress it, walk on eggshells and ride it with the lightest touch and it delivers breath taking corner entry speed and huge lean angles. You don’t feel any of the clumsy stiffness you’d imagine a carbon chassis would yield. 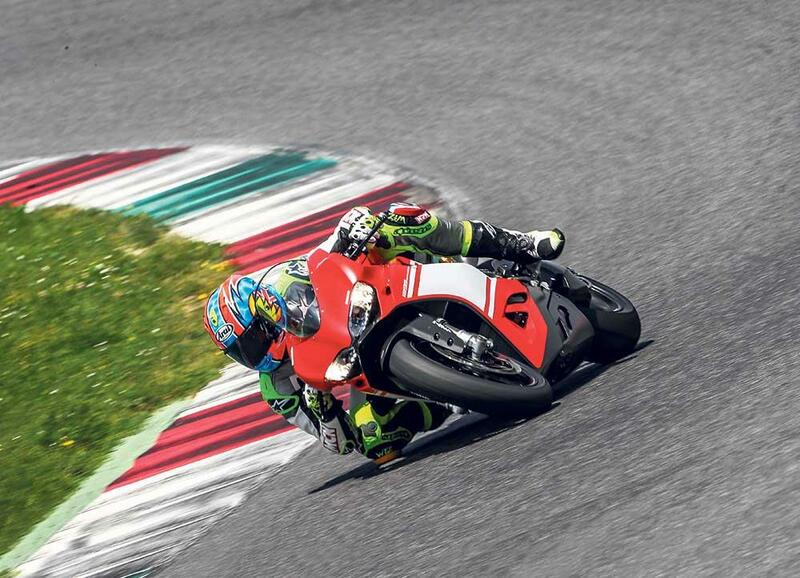 The 1299 Superleggera still has feel and is even easier to ride quickly than its Panigale sisters, thanks to a lightness that enhances acceleration, agility and braking. But it’s not completely perfect: it weaves a little in a straight line accelerating hard through third and fourth, but sorts itself out again flat in the top two gears. That aside the 1299 Superleggera is ridiculously stable at full lean while and under the relentless force of race-grade Brembos at full squeeze. Ducati’s brilliant new electronics make the job of riding easier and safer still. 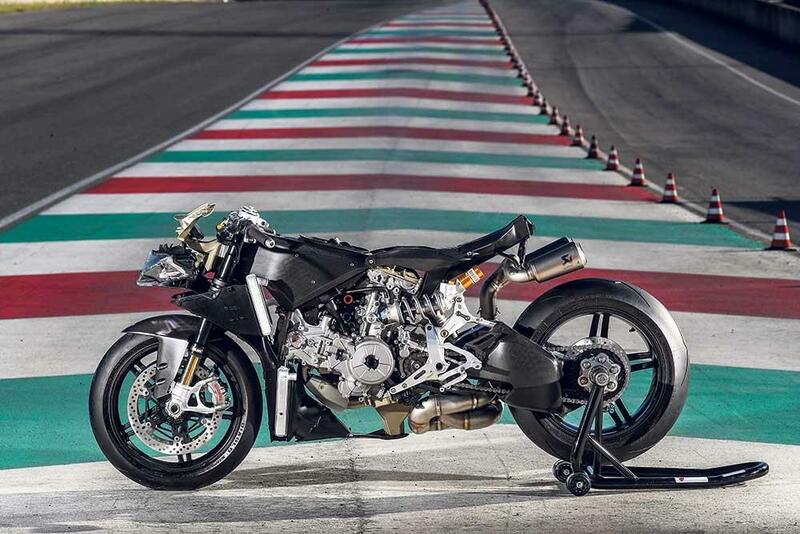 The 215bhp, 1285cc Superquadro motor (up 15bhp on the 2014 1199 Superleggera and 10bhp more than the 1299S and R) is crammed with race-bred parts, including superbike-spec high compression pistons, high-lift cams, aluminium cylinder liners, a lightweight flywheel and crankshaft with tungsten counterweights, titanium con rods, sand-cast crankcases, bigger (than even Ducati’s racing superbikes) titanium intake and exhaust valves and a ported, 0.4kg lighter cylinder head. The engine weighs 2.1kg less than the 1299S’s. Throttle body valves are more aerodynamic, for improved airflow and have different length inlet trumpets to suit each cylinder (they’re the same length on the 1299). A Euro 4-friendly Akrapovic exhaust with WSB-style twin underseat pipes is standard, but you get a 4kg lighter full system included in the price, which boosts peak power by 5bhp and adds 12% more power and torque at 6500rpm. With such a fearsome power-to-weight ratio, acceleration is brutal. The motor is loaded with grunt, as you’d imagine, but it’s quick-revving and thrives on rpm. Fitted with the latest evolution rider aids, none of the engine’s power is wasted on slides or wheelies, so all the 1299 Superleggera wants to do when you open the throttle is catapult forward with muscle-straining fury. 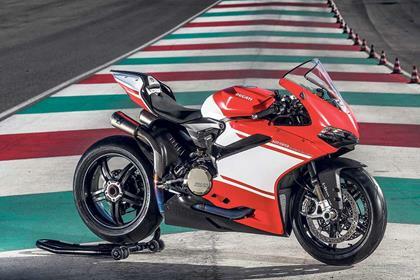 The 1299 Superleggera is a piece of tough, muscular art. 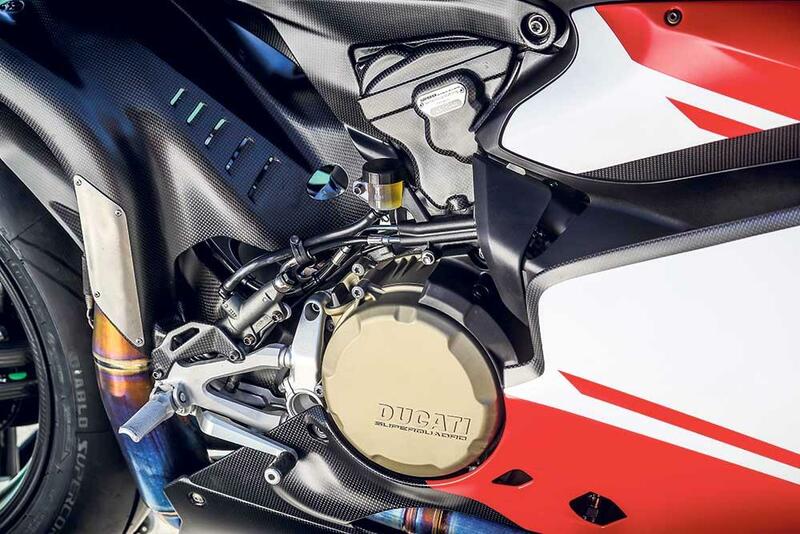 Attention to detail, from the quality of the carbon, the left bar-mounted front brake span adjuster, to the plaque on the airbox with the signature of the engineer who timed-up the motor is a relentless assault on the senses. You could sit and drink in the detail for hours. The 1299 Superleggera is a special motorcycle with a special price tag. But with all 500 already sold second hand values look set to soar as those desperate for a slice of Ducati history will happily pay over the odds for the privilege. 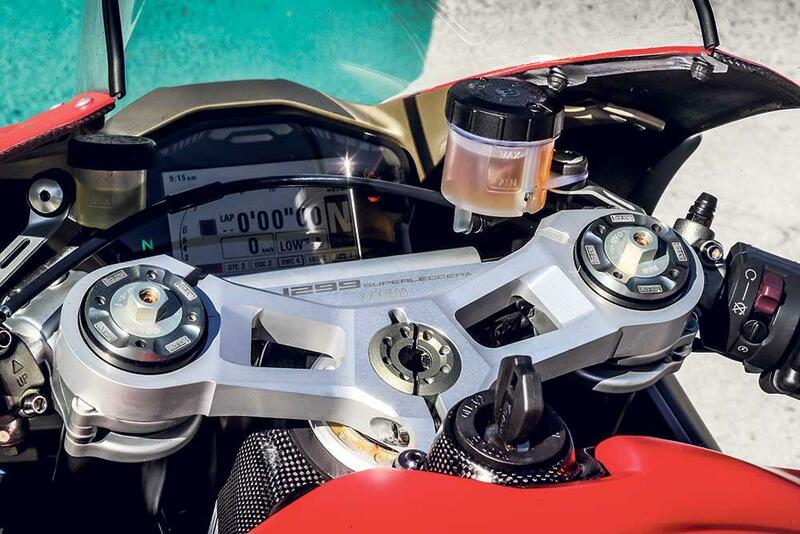 As well as being a riot of carbon fibre, magnesium, titanium, aluminium and loaded with designer cycle parts, the Superleggera is packed with electronic rider aids, all powered by a Bosch six axis Inertial Measurement Unit (IMU), developed alongside Ducati Corse. For the first time on a Panigale there’s launch and slide control, as well as updated traction, wheelie and engine braking control, cornering ABS, an autoblipper, quickshifter, datalogger and a 1.7kg lighter lithium-ion battery. 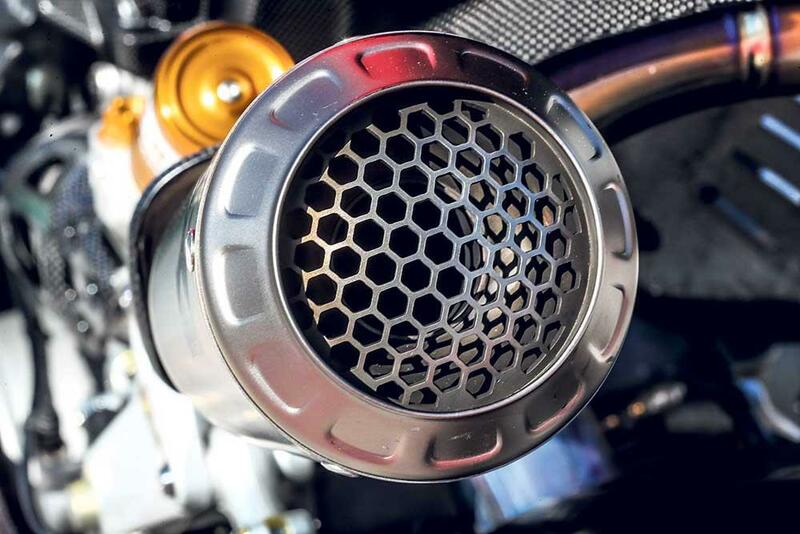 A Track Kit includes an Akrapovic titanium race exhaust system, a taller race screen, machined ali mirror blanking plates, number plate removal kit, track-only carbon bellypan (can’t be used with sidestand), front and rear paddock stands and a bike cover. Rear suspension Single Ohlins rear shock with titanium spring, fully adjustable. Front brake 2 x 330mm discs with Brembo four-piston monobloc radial caliper. Rear brake 245mm single disc with twin-piston caliper. 2014: Original 200bhp, 155kg Superleggera launched. 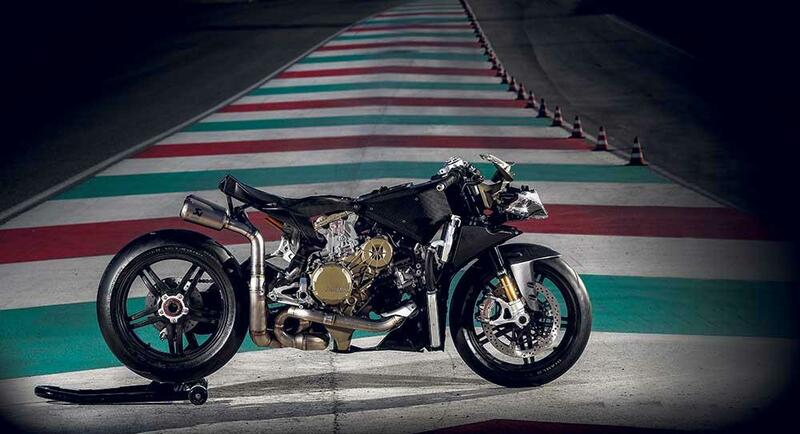 It has 1199 Panigale-derived motor with a magnesium frame, swingarm and wheels. Only 500 of these £54,000 machines were built. 1 owner has reviewed their DUCATI 1299 SUPERLEGGERA (2017-on) and rated it in a number of areas. Read what they have to say and what they like and dislike about the bike below. So close to Chaz Davies World Superbike its scary. Ownership by the VW group through Audi & Lamorghini is very evident in the fantastic build quality without compromising any of that Ducati style.